This page contains a single entry by Westley Annis published on July 24, 2008 11:37 PM. New Element Discovered was the previous entry in this blog. Wide Parking Space is the next entry in this blog. Do Liberals Have a Sense of Humor? 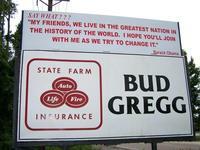 Bud Gregg, a State Farm Agent in Mandeville, La. doesn't like Democratic Presidential hopeful Barack Obama. 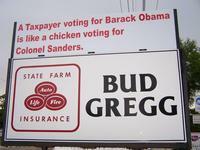 In fact, Bud dislikes Obama enough to have a sign erected over his office sign signaling his displeasure with Obama. Everyone that knows me knows I'm a conservative. I dropped (I didn't leave the Republican Party, the Republican Party left me) my Republican Party affiliation in 2007 when I decided to run for Lafourche Parish Council and a general overall bad taste for the Louisiana Republican Party (someone please get rid of Roger Villere). Anyway, I also run an email discussion list for and about St. Bernard Parish, which is a conservative area, much like Mandeville. One of my subscribers is a client of Bud Gregg and took pictures of the front and back, and emailed them to me so that I could forward to my email list. Since photos of the sign have started floating around through email, there has been a lot of uproar. And, it has fallen exactly as you would expect. Conservatives find it funny as all get out and liberals are branding it as hate-speak. Now, liberals don't mind making fun of President George Bush or Republican hopeful John McCain, so what's the problem with poking a little fun at Obama? Absolutely nothing was said about him personally, only his policies. By the way, Bud did take the sign down. Seems his wife is a school teacher and the members of the local teachers union were not appreciative of his sign. Bud does have plans to rent a billboard near-by with the same message. OBAMA SAYS LET'S TALK NICE WITH OUR ENEMIES. YEAH RIGHT, GO ASK THE FRENCH AND BRITISH HOW WELL THAT WORKED WITH HITLER....THEY WOULD LOVE TO BUY TIME. Listed below are links to blogs that reference this entry: Do Liberals Have a Sense of Humor?.